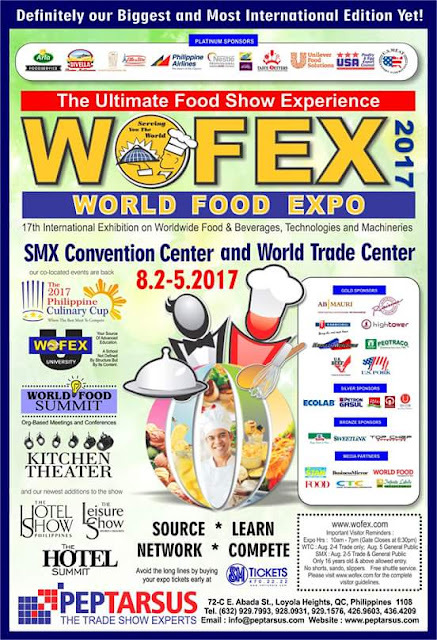 The World Food Expo (WOFEX), undoubtedly the most anticipated food and beverage expo in the Philippines, will be held August 2-5, 2017 in two big venues: SMX Convention Center and World Trade Center Manila. that they top off last year's event hence, making this one the best ever. Read one of my experiences at the link below. Celebrating its 17th year, WOFEX is the only event with two simultaneous venues (and free shuttle), and which has several co-located events at the same time. The Philippine Culinary Cup is the only WACS-accredited culinary competition with chefs from all over the world competing for the gold. WACS is the World Association of Chefs Societies, and bagging awards from PCC means being one of the best. For this year, Philippine Airlines, one of the Platinum Sponsors, will be included in the PCC category, competing for the best airline food. 30 Chef Judges from around the globe will be on hand to pick the most deserving for 20 different categories. Wofex University is the training division of World Food Expo, and this year’s line up boasts of the finest chefs sharing their expertise in their own fields: pastry & bakery, culinary, and catering. The Kitchen Theater is a gathering of the best culinary experts showcasing several products and its application. The World Food Summit brings in major stakeholders of the food service industry for organization-based conferences and hosted meetings. 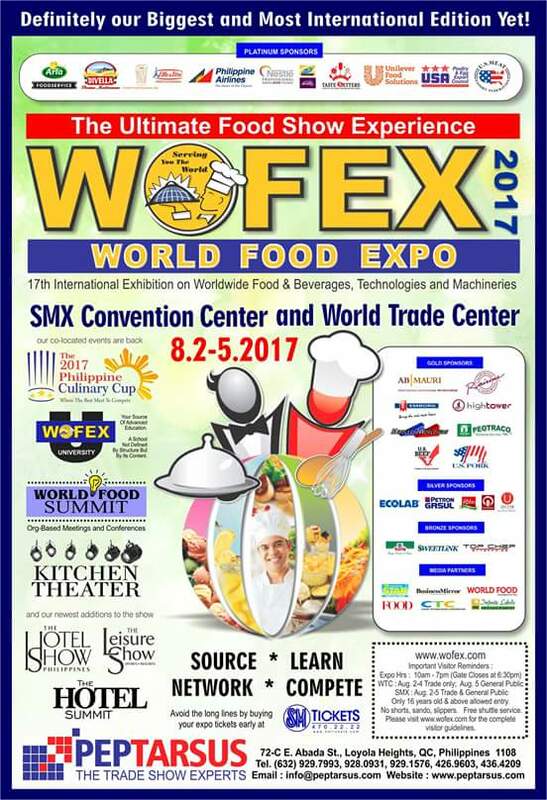 Finally, a first for this year is The Hotel Show Philippines, in collaboration with dmg events and PEPTarsus Corp, organizer of WOFEX. Patterned after The Hotel Show Dubai, The Hotel Show brings in the supplier of the hospitality and leisure industry. Also included is the Hotel Summit where hospitality and marketing industry professionals have been invited to speak on their experiences. For schedules and other information about WOFEX 2017 please check the Facebook page (Wofex) or its website www.wofex.com. Tassels have never been so big, literally! Oversized designer tassels hanging from a slim waist is the sexiest piece of adornment for a bride this season. Tassels always played second fiddle to lehengas, but that's not the case anymore; they are as important as the outfit now. A number of louis vuitton replica handbags designers, such as Manav Gangwani, Reynu Taandon, and Gautam Gupta, have come up with exaggerated tassels that range from floral and jewel shapes to animals and birds. In my recent collection, I tried to innovate with tiffany outlet tassels, says Taandon. We made camels, birds with cloth, and embellished them with mirrors and Swarovski. We're adding them to lehengas, achkans and blouses. These tassels take about a day or two to make, with karigars giving the finishing touches. Brides are also going for customised tassels with cheeky messages and longchamp outlet online danglers for themselves and their bridesmaids. Tassels play an important role when it comes to adding a dramatic element to a minimalistic garment, says Gupta. People ask for artwork or motifs as replica handbags standout features. Names, slogans, and punchlines are trending this season.